I have thought about writing this post hundreds of times but every time I started, words just elude me. I find it to be such an ordeal to describe the emotions of having my second baby that I almost gave up on writing. Yeah, call me dramatic but it was that difficult for me. It wasn't until today that I finally garnered the will to write. Here's the first part of my baby story. 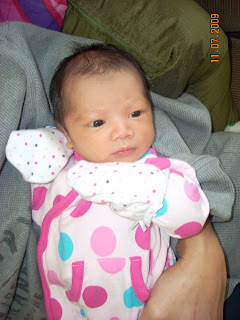 Baby Alva was born via c-section on 26 June 2009 at approximately 10.48 a.m. She weighed about 2.605 kg and measured 49 cm. The moment they pulled her out of my tummy, I must admit I was more surprised than thrilled to finally see her. First of all, she cried so loudly that I was a bit taken aback by her ungirly-baby cries (since she's a girl I was expecting a more melodious sound). Secondly, at one glance, she looked so much like her dad, that I was thinking "alamak, this one has small eyes too?". So, you can't really blame me for not being thrilled automatically. I was after all anesthetized.